Eulerian, one of AppsFlyer's integrated partners, is focusing on the analysis and real-time optimization of e-marketing operations. Based on an exhaustive data collection system, Eulerian marketing suite provides a combination of marketing web attribution and data management solutions. This technology enables users to centralize, analyze, manage and activate data in real time. Enter "Eulerian" in the search field and click on its logo to open Eulerian's configuration window. Eulerian's configuration window includes 4 tabs: Integration, Tracking link, Data Enrichment and Permissions. Click on the items below to read about the tabs setup. Eulerian connects with AppsFlyer via a unique Host ID. If you don't already have it, you must obtain it from Eulerian to continue with the integration. AppsFlyer can send automatic postbacks to Eulerian following user installs. Use this section to define sending these postbacks. 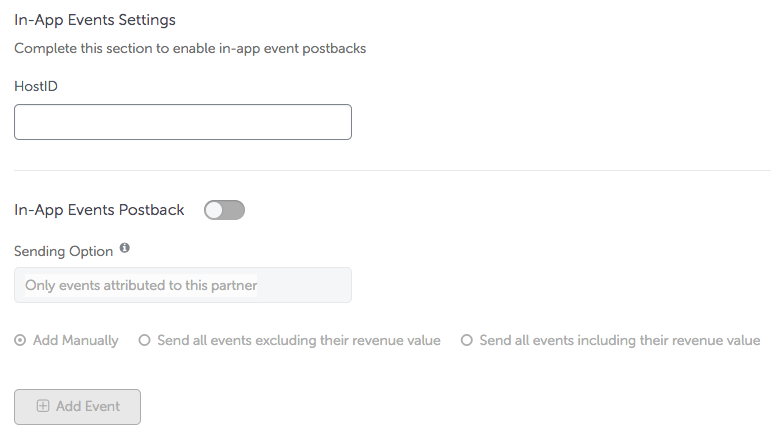 Select Events attributed to any partner to send postbacks to Eulerian. In this section you can map your AppsFlyer events with Eulerian via postbacks. Partner Event Identifier The unique name or ID of each event as defined on Eulerian's side. Obtain the corresponding Event ID from Eulerian and set in the text field. Once saved, AppsFlyer begins sending data to Eulerian for every organic and non-organic install. Tracking Links are not available for Eulerian. Cost is not supported in the integration with Eulerian. Ad Revenue is not supported in the integration with Eulerian. Permissions are not available for Eulerian.